Are you looking for the easiest way to research and find alumni on LinkedIn? LinkedIn has the most amazing functionality and you don’t even know about it! There is an Alumni page for every college and university that lets you sort and filter alumni by where they live, work and what they do. This hidden LinkedIn feature is invaluable for college students, career services offices, alumni offices and alumni! Networking with alumni is a great strategy for your job search. You share the school experience and that makes a warmer way for you to introduce yourself. 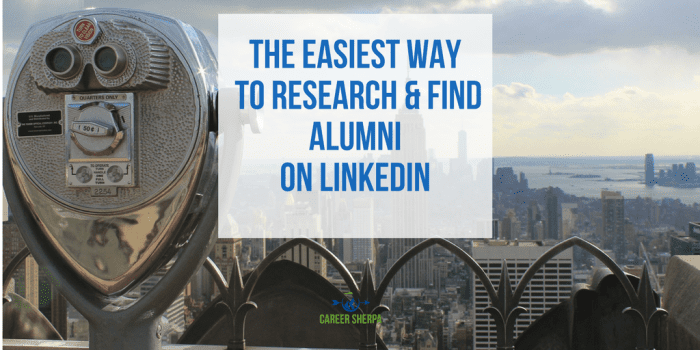 If you haven’t reached out to alumni (or classmates) yet, here are several different ways you can use LinkedIn’s alumni resource. Type in the college or university name from the search bar at the top. Make sure you select the school’s university page, not the employer page. You will see “alumni” in the menu under the header. (And you can do this for ANY school, whether you went there or not!) Click on it! You can filter the results of what you see by clicking on the bars under where they live, work or what they do. This will show only those alumni who meet the criteria. You can search by year alumni attended or graduated. Or you can search by company name, title or any other keyword in the search bar with the magnifying glass. When you scroll down the page, you will see alumni who meet the criteria you filtered or searched for. WARNING. If you are not connected to the person but do want to connect, ALWAYS go to the person’s profile page before clicking on the connect button. This ensures you can add a message to your invite. And YES, you always want to send a personalize message when you invite someone to connect on LinkedIn. Are you looking for career advice or want to know how you can get your foot in the door with your dream company? Simple. If the company is listed, click on the bar to show people who currently work for that company or did work for that company. Or you can search for the company by typing the company name in the search window. As you can see from the results below, there are 23 alumni who currently work (12) or had worked for Google. Scroll down below the aggregate information and you’ll see the profile summary of alumni. You’ll also see the option to “connect” but remember, don’t click on it. Click through on the person’s profile and invite from there so you can personalize the message you send. On the next page of search results, take notice of the top skills people who work in those companies have. Hint, hint: have you listed those skills in your LinkedIn profile (if you have them)? You can enter a range of years alumni attended your school or if you want to see which classmates you graduated with are on LinkedIn, you can do that. Change the “attended” to “graduated” by clicking on the triangle/arrow. 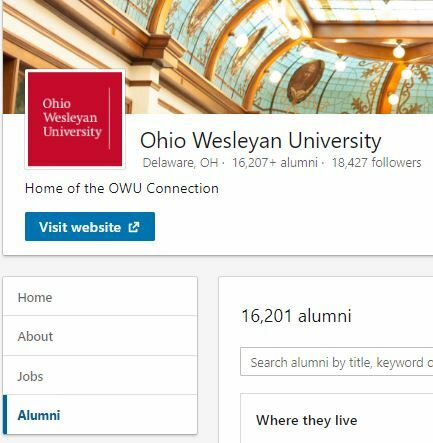 You can see there are 761 alumni on LinkedIn who graduated in 2010. Do you want to relocate to a new city? Try looking for fellow alumni in a new city to make your transition easier. Or maybe you just want to catch up with local alumni. Search for the city under the “where they live” column or if you don’t see it, type the city in the search window. As you can see below, LinkedIn gave me more than what I was asking for. 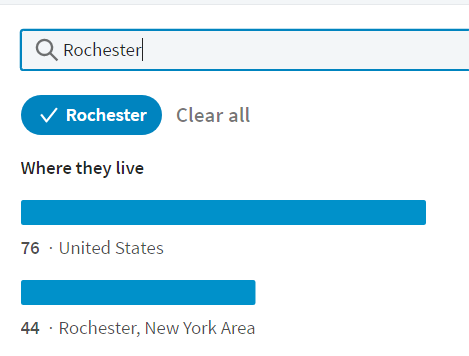 I do see there are 44 alumni in the Rochester New York Area. It’s important to include the right skills in your LinkedIn profile. This shows recruiters you have what they are looking for. 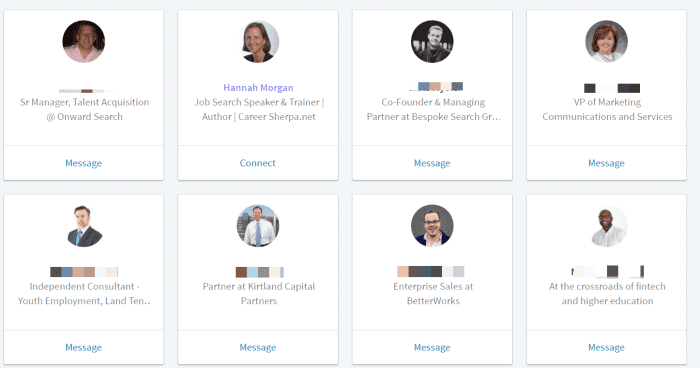 To do this, find people who work at a company you are interested in, look at the Skills column and make sure you have included the same skills in your Skills & Endorsements section, Summary, Experience and even your headline. Do you want to find alumni who can speak to your current students, show students the companies alumni work for, or evaluate popular skills by job type? You can. LinkedIn created this guide to help career services use the alumni tool for career counseling. If you are in college and looking for an internship or job, make sure you have a great LinkedIn profile. Here’s a checklist for you. If you want more help on using LinkedIn, see LinkedIn’s official resources for college students.